Today's art project is literally the easiest Halloween art activity ever. (Really!) Continuing with our month long theme of Halloween Crafts, I recently gave my son a fun art prompt- to draw a family portrait... with a twist! Rawr! 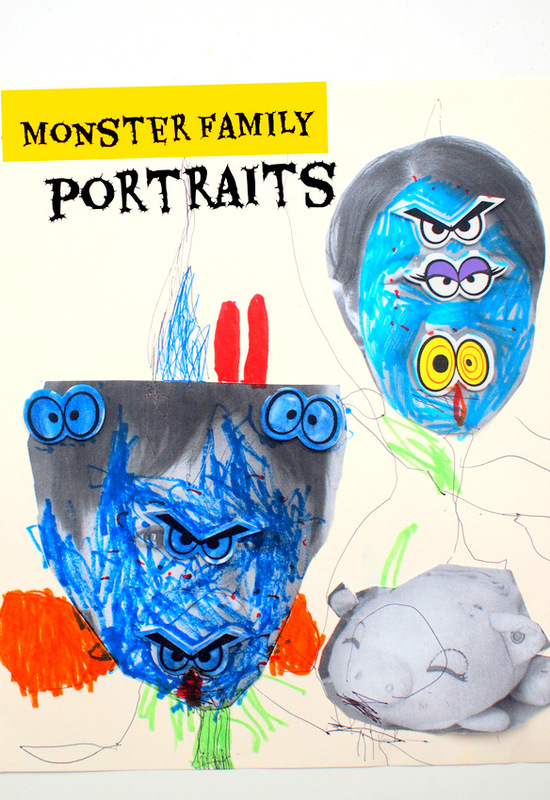 Spooky Monster Family Portraits! This was a great art project to try out with my 4 year old because he's currently really into Halloween AND he enjoys drawing pictures of our family. By the way, if you're looking for some fun monster-themed books to go with this art project, here are some of our current favorites. To set up this art prompt, I first printed out photos of our family members. We cut them out together and he glued them (using a Glue Stick) to a sheet of paper. Then, I gave him a bunch of markers and eyes (you can use Googly Eyes or these fun Eye Stickers) and challenged him to transform us into the spookiest monster family around. He went to town giving us crazy eyes, wings, claws, horns, and spikes. I really enjoyed seeing his imagination at work! Oh yeah, here's an up close shot of what he did to my photo. Hope you enjoyed this Halloween-themed craft! Here are a couple more that your preschooler would enjoy! Today's post is a collaborative one! This means that 5 other preschool-activity-loving bloggers are sharing 5 other fun monster activities on their sites as well! So go ahead and check these other awesome ideas out!